The New Museum’s mission is to promote “New Art, New Ideas.” School and Teen Programs utilize the Museum as a resource to enhance learning and to engage high school students through the exploration of contemporary art—connecting educators and teens to local, global, and cultural issues that affect their lives. For more information about our programs, please contact schoolandteen@newmuseum.org. The New Museum inaugurated its first annual convening of activists, artists, and educators to exchange knowledge and methods for generating critical discussion and structural change while promoting safer and braver spaces in summer 2018. As a noncollecting institution working primarily with living artists, the New Museum is poised to be responsive to ever-present and increasingly urgent priorities of inclusiveness, while taking stock of activities relevant to contemporary art, education, and social change. 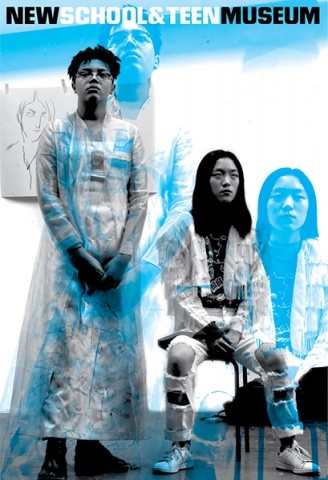 The Museum has published two historical books on contemporary art and education to generate, assemble, and disseminate work in the form of essays, artist entries, and lesson plans: Contemporary Art and Multicultural Education (1997) and Rethinking Contemporary Art and Multicultural Education (2011). Over the last decade, the Museum has actively created content, tools, and methods for employing contemporary art as a resource for engaging youth and communities in questions and ideas that matter to them. As the Museum considers its next step in making such tools and knowledge further available to educators, the new multi-day Convening for Contemporary Art, Education, and Social Justice invites artists, activists, classroom teachers, and educators in other settings to share best practices. Please check back here next summer for registration and more information. Lesson plans are designed to incorporate contemporary art into the classroom. Developed in collaboration with the New Museum’s school partners, each lesson plan promotes observation and interpretation through inquiry, experiential activities, and extended peer discussions. Lessons foster an informed, critical understanding of art, culture, and current events. Professional development days are led by artists, curators, and educators and are designed to guide teachers in methods that activate contemporary art in the classroom. The multifaceted programs expose teachers to contemporary art history and offer tools to inspire critical thinking, focusing on the integration of new art and new ideas with school curricula. The New Museum encourages educators of all disciplines to participate. Programs take place during New York City Department of Education Conference Days from 9:30 a.m. to 12 p.m. and are followed by workshops from 1 to 3 p.m. The New Museum currently partners with Gramercy Arts High School, City-As-School, Hetrick-Martin Institute, Broome Street Academy, and Fortune Society. Through a multi-visit program, teachers and New Museum educators collaborate to use the Museum’s resources as a tool to enhance learning in the classroom and beyond. Activities cultivate students’ self-expression, critical thinking, and visual literacy skills through an innovative curriculum. The New Museum offers discounted annual memberships for teachers. For more information, please contact 212.219.1222 ×234 or membership@newmuseum.org. Follow New Museum School and Teen Programs on Facebook and Snapchat for the latest updates and program news. Youth Pass is a free Membership option for young people ages fifteen to eighteen. Sign up in person at our Visitor Services desk to obtain your annual pass. Every spring and fall, this free semester-long program offers fifteen participants the chance to learn about contemporary art, engage directly with artists, and participate in intimate, critical discussions about culture. Through close work with peers in interactive workshops, participants have the opportunity to collaborate with artists in residence at the New Museum. Each semester focuses on an R&D Seasons theme. Past themes have included SPECULATION, PERSONA, LEGACY, DEMOCRACY, BODY, ANIMATION, and GENERATION. The Museum encourages applications from prospective participants who are curious about contemporary art and enthusiastic about connecting with their peers. Please check back here in the fall for information about the Fall 2019 season of ESP. Each summer, the New Museum Teen Apprentice Program offers students work experience and exposure to contemporary art and ideas through on-the-job-training, career-development talks, field trips, and group projects that engage the Museum’s summer exhibitions. A stipend is available for all selected participants. Youth are selected via lottery through the city’s Summer Youth Employment Program. You can apply directly on the Department of Youth & Community Development website. Once selected, youth will be placed at the New Museum via the program provider, Chinese American Planning Council in Manhattan. As part of the Department of Education and Public Engagement’s ongoing programs around arts and social justice, the New Museum hosts the third youth summit and celebration organized by a luminary group of artists, writers, and activists committed to community building, including Asian American Feminist Collective, Unapologetically Brown Series, Scope of Work (SOW), and the New Museum Youth Council. Each youth summit builds upon and reinterprets the principles of healing, self-love, skill building, political education, and empowerment established by the inaugural committee. When: The 2019 Youth Summit will be held on Saturday, April 13.